Marabella Commercial Finance to coordinate a Net Lease Networking and Informational panel that will take place around April 25, 2017 in La Jolla, CA. Also several “Net Lease TV” Interviews will take place at this event. To participate as a speaker for this event con- tact Chris Marabella. Studies have found that there is not a direct correlation between interest rates and cap rates as indicated in the graph below taken from a report written by Ernst and Young LLP in September of 2015. Ac- cording to the article Rising Interest Rates will not immediately threaten real estate values. The article details 5 points why the strong real estate cycle will continue even with possibility of Federal Re- serve interest rate increases. Marabella Commercial Finance does not guarantee or endorse any of Ernst and Young’s opinions in this newsletter. 1. 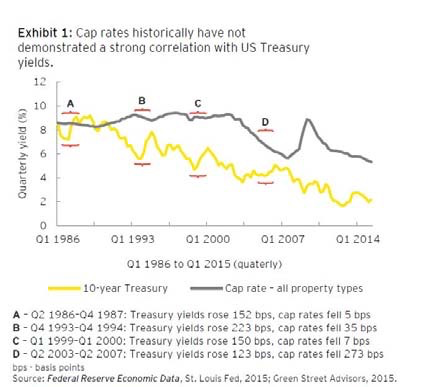 Historically there has been no strong correlation between the 10-year Treasury yield and CRE Cap rates. They state the spread between interest rates and cap rates has a more significant effect. 2. The impetus for the Fed’s expected rate hike is improving domestic economic performance. 3. Improving economic conditions should engender stronger CRE Fundamentals. 4. Capital flowing in US CRE continues to be robust. 5. A rise in federal funds rate may not have a substantial near-term impact on the cost of many types of CRE debt. The article goes on to say from the 1980’s to present day, there have been several instances where cap rates and Treasury yields moved in opposing directions (see graph). 1 DaVita / 2 Fresenius $11,000,000 30 Yrs. 7 Yrs. 4.25% Funded. 7 Dollar General Stores $4,625,000 30 Yrs. 5 Yrs. 4.69% To Be Funded. 7-Eleven / Car Wash $2,700,000 25 Yrs. 7 Yrs. 4.95% To Be Funded. Rite Aid $2,330,000 20 Yrs. 5 Yrs. 4.65% To Be Funded. 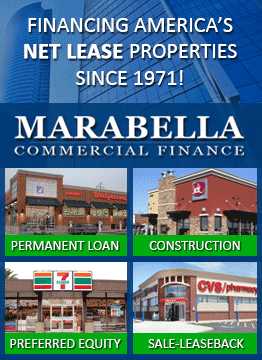 Call Marabella Today to Discuss Financing For Your Net Lease Transaction! Copyright 2019 - Marabella Commercial Finance, Inc. - All Rights Reserved.